You have to admire Sebastián Lelio’s utter dedication to his craft ; over the last few years, the Chilean filmmaker has been hard at work making no less than three films, all across different continents – his Oscar-winning feature A Fantastic Woman was shot in his native Chile, his English-language debut Disobedience was shot in the UK, and the film that we’re going to be discussing here was almost entirely shot in LA – and all with the same amount of passionate energy, even though one imagines what working on three major projects within a short gap of one another does to the circuits inside one’s head. Nevertheless, he’s managed to make three movies in about as many years, but even more impressive is how each and every one of them is in their own unique way an outstanding piece of work; A Fantastic Woman was an uplifting and empowering look at difficult themes of identity and intolerance, Disobedience was a much quieter and more intimate affair that still packed a powerful emotional punch, and now Gloria Bell is a joyous celebration of life that’s irresistibly upbeat and extremely engaging all throughout. His trilogy, of sorts, shows that Lelio is a real storytelling force to be reckoned with, and luckily he’s managed to save the best for last. The film is a reimagining of Lelio’s 2013 Chilean drama Gloria, which starred Paulina García in an award-winning central performance; here, it’s Julianne Moore who plays the titular Gloria Bell, a middle-aged divorcee who spends her days working at an insurance firm and checking in on her adult children (played by Michael Cera and Caren Pistorius), and spends her nights at several dance clubs drinking and, of course, dancing. It’s during one of her outings that she meets Arnold (John Turturro), who is himself divorced but is still relied heavily upon by his own adult daughters who financially depend on him and call him frequently. They start a relationship, only for things to see-saw rapidly with his increasingly odd behaviour, and threatening the usually upbeat Gloria’s outlook on life. I haven’t seen the original so I cannot compare both this and its predecessor, nor can I comment on the different approaches that actresses García and Moore bring to this particular character, but I can say that it’s a story and a lead character that’s captivating enough to warrant not one but two versions of them existing. For this version in particular, Lelio really allows his leading actress to spread her wings and soar in the role, enabling her to exhume the positive spirit that this character inhabits while also letting her find the vulnerability within her overly-generous soul, something that tends to keep letting her be taken advantage of by certain characters throughout the film. Moore is absolutely outstanding in the role, which shouldn’t come as a surprise seeing how Moore is a terrific actress anyway, as she really shows how sweet and caring this character is but also unwilling to let herself be trampled over all the time; she’s a person with a fighting spirit, and Moore perfectly captures the joys as well as the downfalls of someone with such an optimistic perspective on things. The filmmaking itself perfectly complements Moore’s shining performance as well as her apparently eternal beauty (she is in her late 50s as of this review, but she still looks amazing; I guess having talent to spare is good for the aging process). Lelio’s direction is tight enough to keep itself focused on the events on display, but loose enough to let the characters, and by extension the actors, feel natural and act like real human beings; his script is also perfectly paced, and somehow manages to make scenes of nothing happening feel like the most action-packed and suspenseful mini-adventures, largely down to how interesting and likeable the majority of these characters are. It’s also beautifully shot by cinematographer Natasha Braier, who winningly makes every scene with Moore’s presence glowing in the LA sunlight – an extremely frequent scenario, seeing how Moore is rarely ever off-screen, if at all – and seeing how many scenes take place in a disco-like environment, the film additionally has an excellent soundtrack with tunes by Earth, Wind and Fire, Air Supply, Bonnie Tyler, and Laura Branigan (guess which one of her songs plays during a pivotal moment in the film). It’s such an elegant, happy and all around uplifting movie, with barely a hint of cynicism in its entire body, that it not only makes me curious enough to check out the original to see how it compares, but it also leaves me wondering if this has the true potential to stay within the public consciousness for long enough for it to get noticed at some end-of-year awards ceremonies, especially for Moore’s completely enthralling lead performance. Something tells me that it probably won’t make it to that point, but I am willing to be proven wrong over time; after all, if other early-year releases such as Get Out or Black Panther can make a splash at the end of their respective years, then I think that this film has a fair enough shot, if only to see an actress like Moore get the attention she deserves for helping to turn a potentially pointless remake into something that’s completely justifiable in its existence. It’s a blast, and I hope people respond well to it when it makes it to UK cinemas (it’s due out at the beginning of June, but don’t expect a second review on it; however, that doesn’t mean I’m not planning on seeing it again at some point). 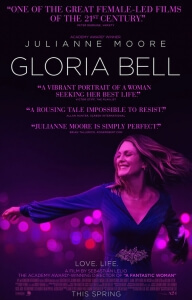 Gloria Bell is an upbeat and wonderfully optimistic look at the life of a middle-aged divorcee, brought to stunning life by Julianne Moore’s outstanding lead performance as well as a strong script and direction by Sebastián Lelio, who reimagines his 2013 film Gloria as a sweet and uplifting crowd-pleaser without a cynical bone in its body.